Wurttemberg. Wilhelm II gold Proof 10 Mark 1905-F PR66 Cameo NGC, Stuttgart mint, KM633, Jaeger-295. Delightful satin texture on the central motifs contrasts pleasingly with the fields and the strike, as one might expect of a proof, has been fully executed, rendering every minute detail in exceptional clarity. Upon magnified inspection, traces of as-made chatter becomes visible in the fields, but the surfaces remain refreshingly absent of hairlines due to careless handling. 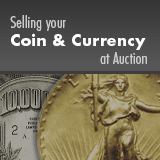 A high-end Gem by any standard, and as such, a coin that will inevitably attract significant bidder attention.